You are at:Home»Hunting»Hog Heaven…or ? Imagine being able to hunt all year round with no special permits to purchase. You’d be able to keep your freezer stocked with meat during the off-season, keep your shooting skills in top form (or even improve), and you would be providing a great public service. It’s not a dream and it’s not scam – it is real life that is taking place every day for ordinary people just like you and me. When it comes to feral hogs, there is no such thing as a fair fight, and you should be prepared to hunt these animals with just about everything you have at your disposal. Feral hogs rank #2 on my most wanted list – only the coyote outranks it. You may have heard the saying “It doesn’t matter what kind of hunt I’m on, if I see a coyote, it just turned into a coyote hunt.” Well, go ahead and add feral hogs to that while you’re at it. Every single time I go out into the woods – whether it’s to scout or hunt – I’m on the lookout for hogs or any sign of where they’ve been so that I can come back later and provide a little public service. Over time, they developed a fear of humans and would shy away from such contact. They should not be confused, though, with the Eurasian or Russian wild boar that was introduced in the early 1900s for the sole purpose of hunting. However, it was only natural that these two species would eventually cross paths in the wild and crossbreed, resulting in a hybrid species. A study by Mississippi State University in 2013 found that feral hogs have been reported in at least 45 states, stretching as far north as North Dakota and as far west as Oregon. The current estimated population in the U.S. varies widely by source but most sit between 4-6 million. And unfortunately, Texas currently has the largest population of any state, with their numbers currently estimated at over 1.5 million by the Texas Parks and Wildlife Department. Oxford (again) defines invasive is as “tending to spread prolifically and undesirably or harmfully.” These animals perfectly fit the definition of an invasive species. If the dictionary publishers were open to suggestions, I’d request that they post a picture of a feral hog next to the word. They provide no benefit to their adopted environment. Just perform a simple search on the internet for “feral hogs rooting” and you’ll get an idea of what kind of damage they are capable of inflicting on a field of crops. Even though they don’t pose a direct threat to humans, the diseases they carry can be transmitted to livestock. According to a recent study conducted by Texas A&M University, in Texas alone, feral hogs caused $52 million in damage to crops in a single year. And while they’re not considered to be active predators, that doesn’t mean they won’t prey on fawns, lambs, goats, or the eggs of turkey and quail. And while not posing a direct threat to humans, the can carry diseases (like pseudorabies, swine brucellosis, tuberculosis, bubonic plague, hog cholera, and anthrax) that can be transmitted to livestock. If you factor in the internal parasites that they carry, such as stomach worms, kidney worms, round worms, and trichinosis, you can begin to see that they are more of detriment to the land rather than an essential or vital part of it. And finally, when you consider that a sow can breed as early as 6 months of age, can have up to 2 litters per year, and can have of an average of 4-6 in a litter with up to 10-12 under the right conditions, you really start to get an idea of how quickly and badly we’re losing this war. So, have I got your blood boiling enough yet to go after these things? I hope so, because everyone, everywhere that has hogs on their property needs your help. Under Texas law, all you need is a Texas hunting license – that’s it – no special permits, regulations, seasons, or bag limits. Check with your state, though, about any special provisions that they may have. 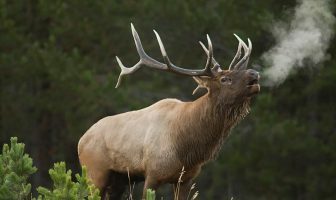 Obviously, you’ll need permission from a land owner if you’ll be hunting them on private property, and some areas of public land in Texas have a “season” for them, but for the majority, it is truly open season. The only thing you need to decide is how you want to go after them. Pick one off from several hundred yards out? Go for it. Stay in good form with the bow during the off season? Bust them at 20 yards. Hogs mainly move at night, so maybe you’d like to get some fun in with night vision or thermal optics gear. Many outfitters in Texas now offer such hunts at very affordable prices for an all-night excursion with the equipment included. Maybe you have a steady enough hand to take one with a pistol or you want to go caveman style on them and put their lights out with a spear? It sounds a little ridiculous, but go for it! By any and all means, we just want to get rid of them. Just abide by all state laws and regulations while you do it. No Good Alternative to Hunting! In 2017, the Texas Department of Agriculture approved the use of a warfarin-loaded poison for use on feral hogs. Warfarin is a blood thinning agent and the poison is only supposed to only affect hogs. As a warning sign to hunters, it will turn the fat blue after hogs ingest it to make it obvious that the animal was poisoned. However, the Texas Wildlife Association points out that lethality can be highly variable and movement of the hog after ingestion risks other species if the carcass is scavenged or the bait is accessible by other animals. Courts eventually decided to disallow its use. More recently, the USDA proposed using a bait laced with high concentrations of sodium nitrite. In small quantities, it is a preservative, but it is toxic to feral hogs when eaten in large doses over a short amount of time. However, a recent trial proved troubling when 200 birds were found dead around the feeder distributing the poison. But, that just goes to show you that manpower in the field is still the best option for trying to keep their numbers in check. Prepared correctly, you may have a hard time eating domestic pork again. Cleaning a hog is the same as cleaning any four-legged animal. Their hide is tougher, but if you can get past that and if you have any experience working with a deer, you’ll breeze right through a hog. And while they may smell bad, the meat is well worth the trouble. Prepared correctly, you may have a hard time eating domestic pork again. In the wild, a hog is an extremely lean animal in terms of fat. Smoked tenderloin, roasted ham, and sausage are just a few of the ways you can make a meal out of these animals. So, what are you waiting for? Get out there and get after these things! If you’re reading this and you’re in another state, get down here to Texas and give us a hand! Take as many as you want, we’re not going to complain. If you’re in a state with a known feral hog population, ask around and see what kind of problems landowners are having with them. Offer to give them a hand with taking a few off the property, many people will still let you hunt them for free simply because they want to get rid of them. In the end, it’s all up to us. Yes, definitely check with your state Fish and Wildlife Commission or Department of Natural Resources. Some states do not allow the general public to hunt feral hogs and handle it exclusively through their wildlife management personnel. We, at Today’s Hunter, always encourage you to stay legal and stay safe. Thanks!